Moving into Phase 3, the missions start to escalate and another draw will lead to the neutral missions. 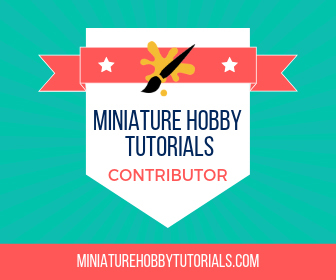 Ambush deployment, Imperials must get units off either of the short board edges. Imperial forces deploy first and get first turn. Chaos can attempt to seize the initiative. 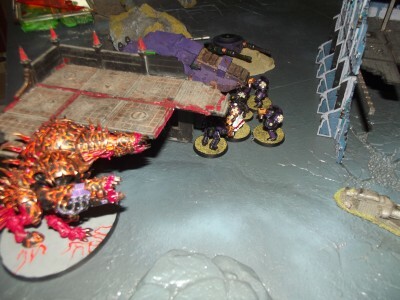 Imperials gain D3 victory points per escaped unit. Chaos gets 1 victory point per destroyed unit. Secondary objectives: Onslaught attack, strike the head. Gain 1 victory point for each unit destroyed in the first turn. 3VP for slaying the warlord within the first three turns. List unchanged since last game. 6 Leman russ tanks, 1 punisher with hull heavy bolter, 4 demolishers with hull heavy bolters, 1 demolisher with hull lascannon. Morose canyon: Fifty miles north of Altum. Captain Kraken noted that the convoy was approaching a fork in the road. The auspex array mounted on the Spartan had detected the enemy pursuit. 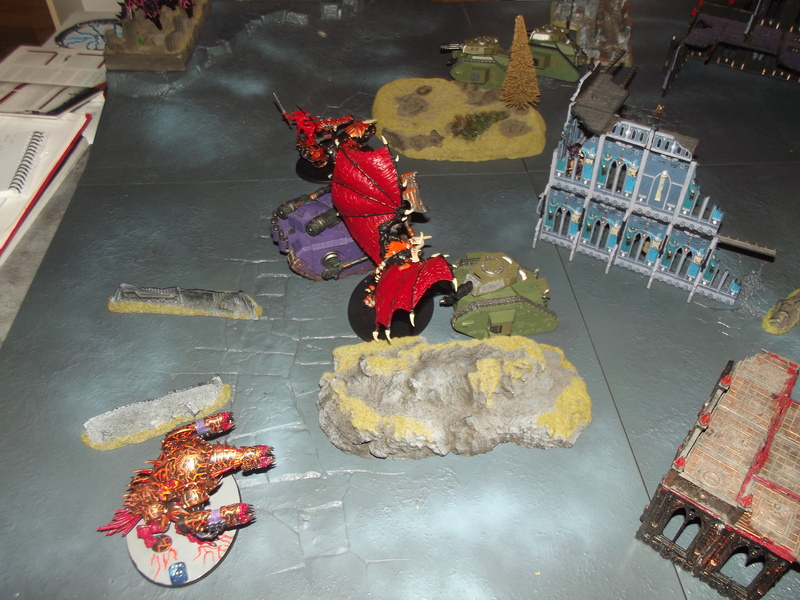 Minor skirmishes had already been fought against a handful of minor daemons and he had a decision to make. Lord commander Solomon Gyre watched the approaching Storm Hawk forces from within his Bastion. The fools were driving directly into his trap. As they reached the centre of the target site he gave the order to engage and his forces threw off their camouflage and took aim. Rather than back down his foes charged forwards vehicle engines roaring. Sporadic fire issued from their weaponry but still managing to knock the legs from a Soul Grinder and blow one of his rhinos apart. The unit within jumped out and were immediately targeted losing a few members to the enemies shooting. Snarling he gave the order to fire at will. 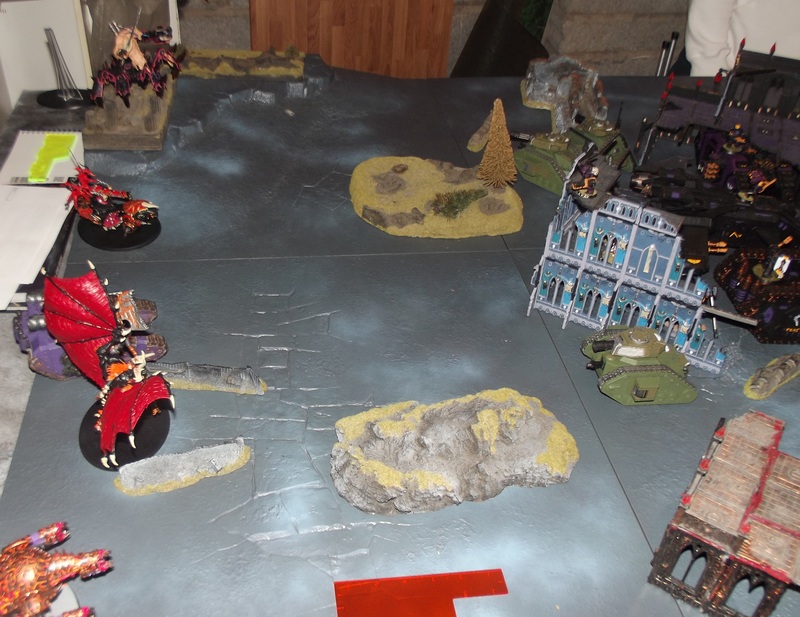 The chaos daemons along with the Emperors children Sicaran patrol the left flank while the bulk of the EC forces and a lone blood thirster are deployed on the right flank. 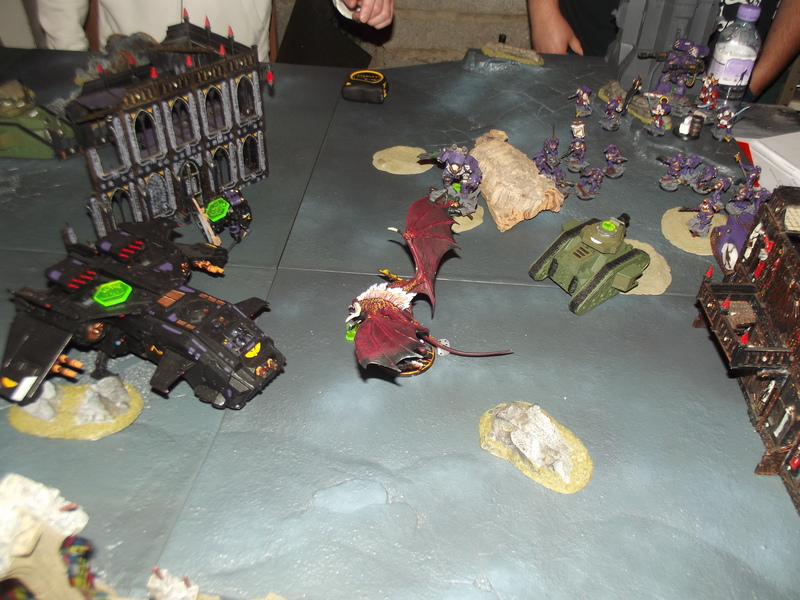 The storm hawks surge towards the EC lines while the Leman russ tanks move to slow down the chaos daemon forces. The Emperors Children Rhino explodes from a demolisher cannon strike and this kills one of the marines within as they pile out. Things are not much better on the other flank. 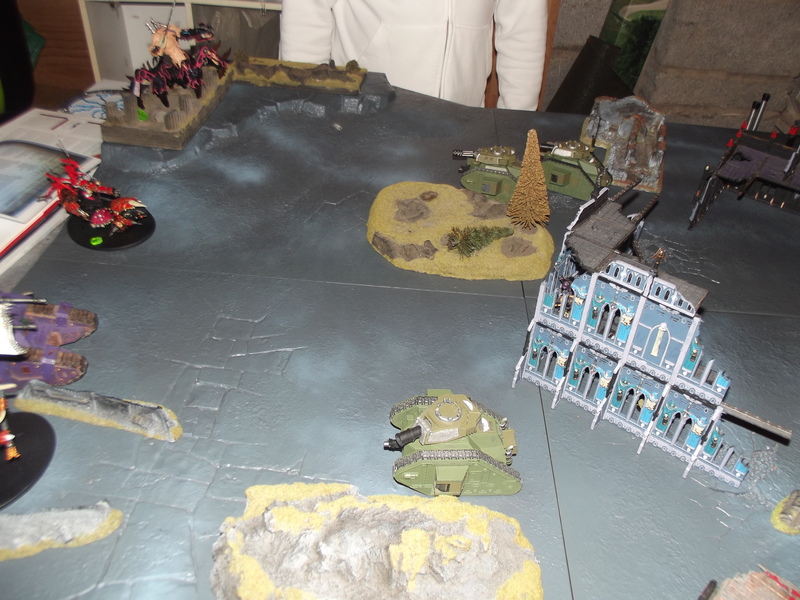 The Leman russ tanks do manage to immobilise the Soul grinder and take a hull point from the skull cannon. The Blood thirster of Rage moves to 1” away from the Leman russ demolisher. 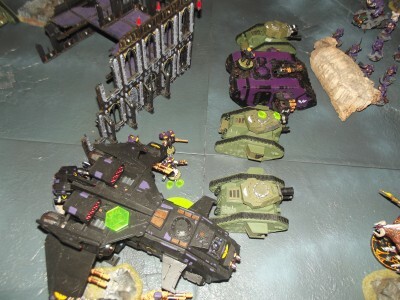 The sicaran, forgefiend and Skull cannon move up. 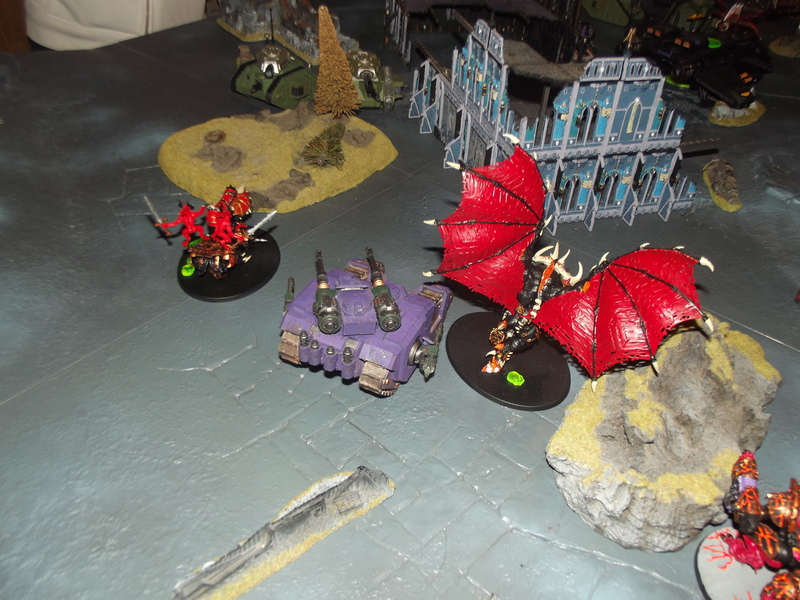 The blood thirster moves towards the enemy tanks as the Emperors children contemptor moves to engage another Leman russ tank. 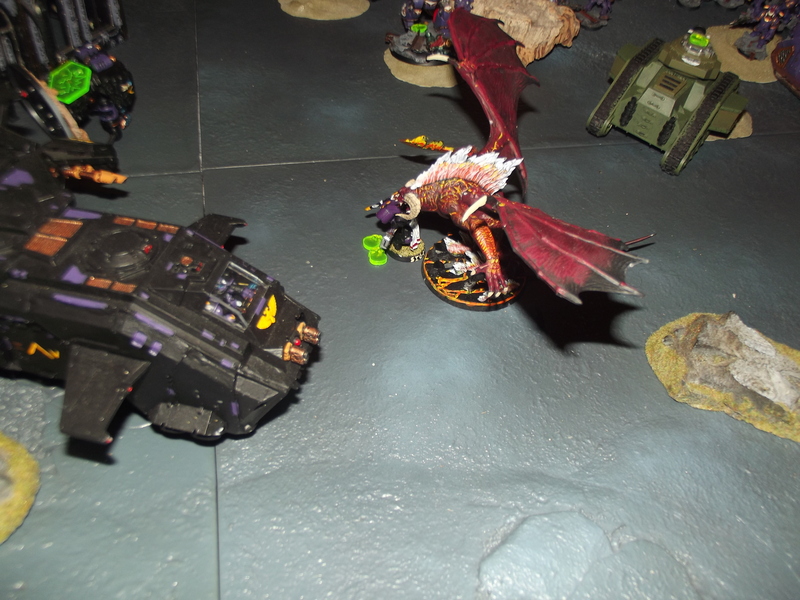 The Storm eagle is wrecked by the fire from the legion heavy support squad in the bastion. Having been forced to bale out the skyclaws suffer multiple casualties from a phosphex barrage. The Leman russ demolisher has lost 2 hull points to the shooting from the Chaos line. The blood thirster of Rage strips 28 hull points from the Leman russ demolisher and blows it apart with its D axe. The contemptor rips another leman russ apart while the second blood thirster can only manage a single glancing hit on its target. 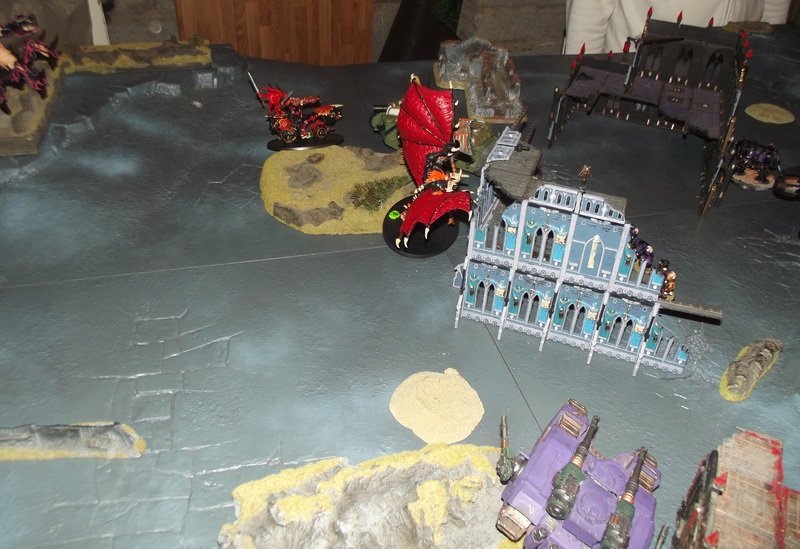 The storm hawks continue to advance towards the breakout point as the skyclaws with their captain move to engage the blood thirster. Wary of the blood thirster of Rage the two leman russ tanks move back and the punisher opens fire taking a wound from the daemon, the Leman russ demolisher blows the weapon from the skull cannon. 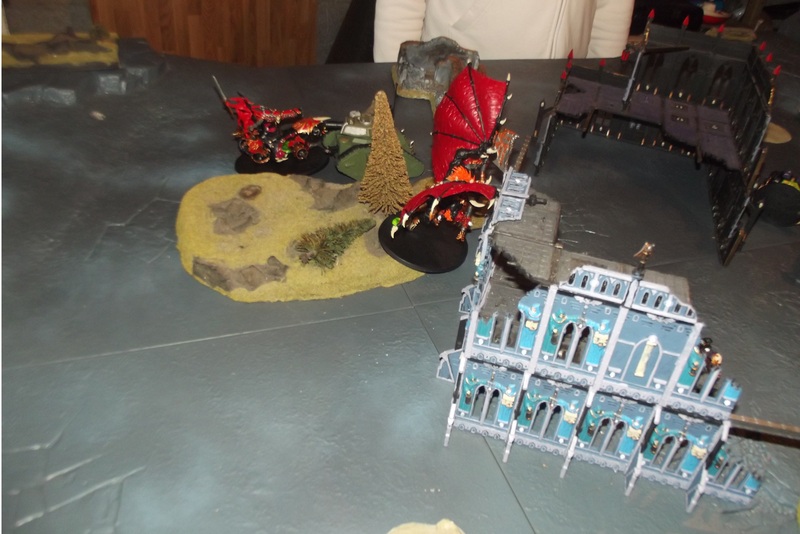 The Skyclaws charge the blood thirster and lose 2 men. 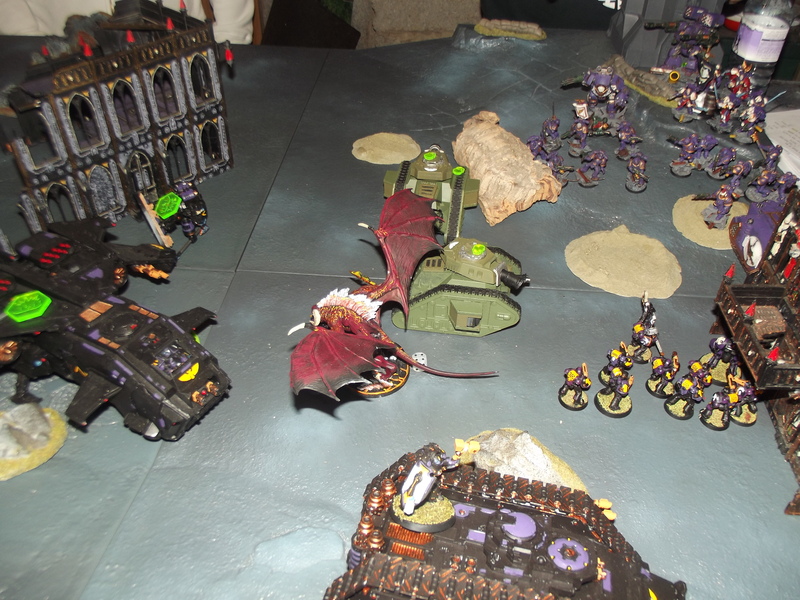 The captain and the remaining marine then take a wound from the daemon. The blood thirster of rage and the weaponless skull cannon move to engage the leman russ tanks. The sicaran finds an angle where it can target the blizzard shield dreadnought from behind. 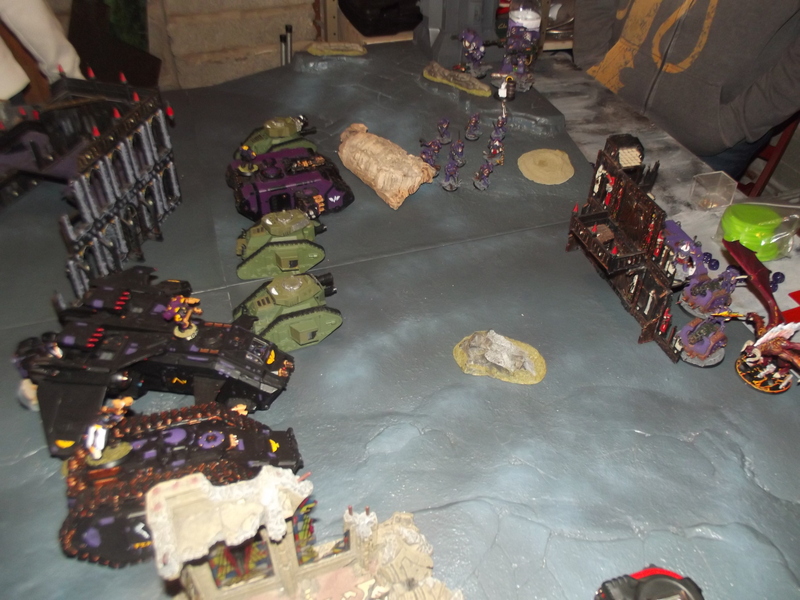 The emperors children rhino bursts forth and blocks the land raiders route, the Preator and his squad along with the second veteran tactical squad move to aid in the blocking manoeuvre. 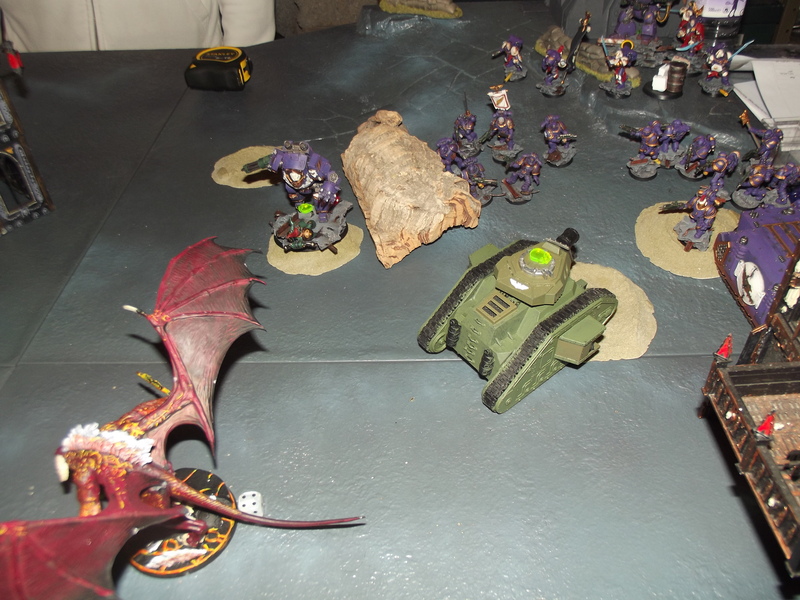 The contemptor moves to target the land raider if it survives. 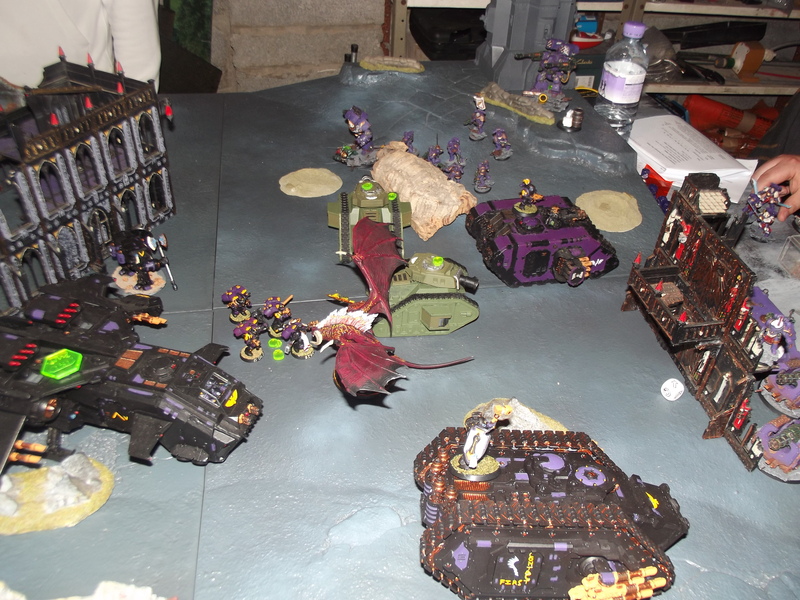 The land raider is blown apart by the multi melta on the emperors children rhino. Piling out the storm hawks are placed out of flamer range and lose a marine to the boltguns of the veteran tactical squads. The other shots bouncing harmlessly from the runic armour of the wolf priest. The blizzard shield dreadnought is wrecked by the attentions of the sicaran. 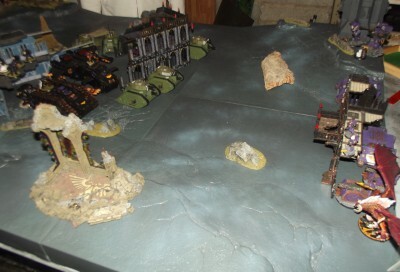 The contemptor charges over the terrain to catch and blow apart the wounded Leman russ. The blood thirster and storm hawks continues to do nothing to each other. 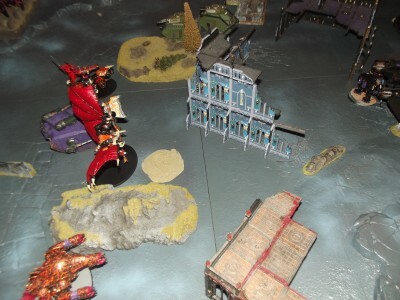 The blood thirster of rage removes 36 hull points from the leman russ punisher and blows it apart. The skull cannons hammer of wrath does no damage. 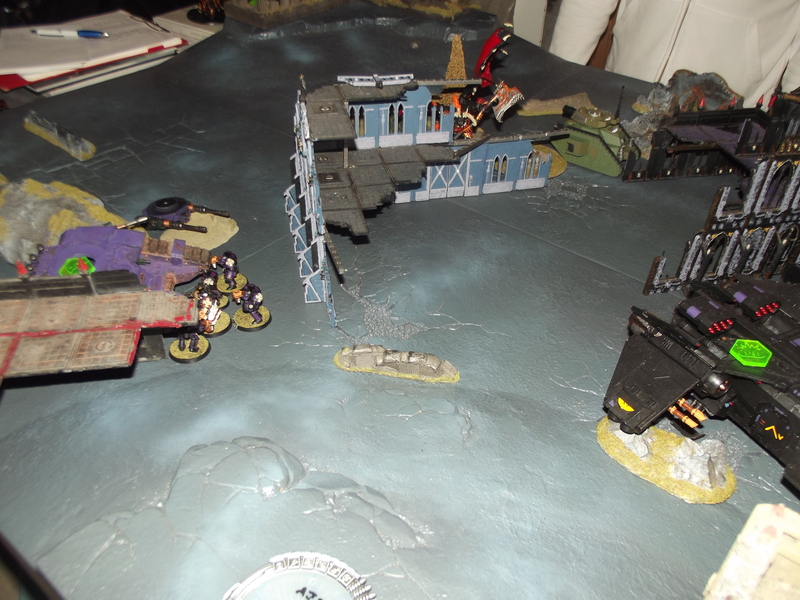 The grey hunters, the wolf priest, the Spartan, THSS terminator squad and captain Kraken escape the table. Squad Razak tear the sicaran apart to avenge the blizzard shield dreadnought. 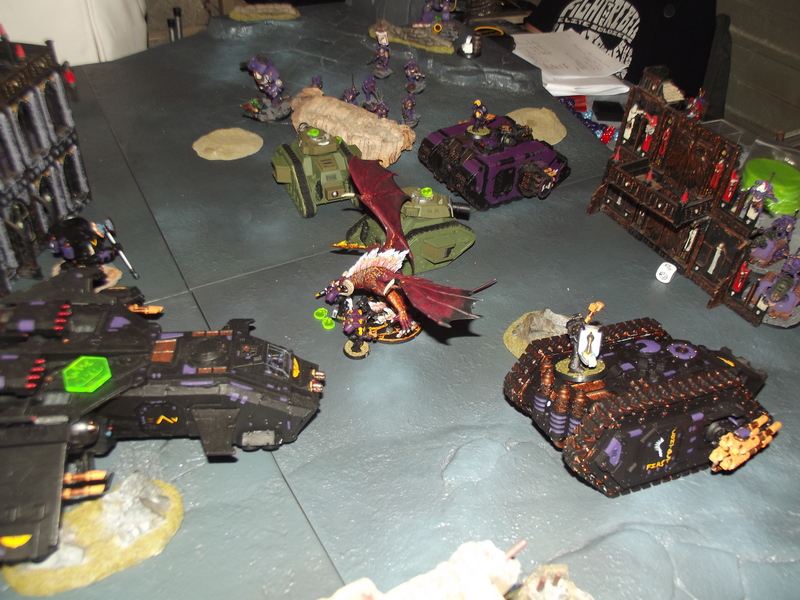 The other LR demolisher blows the skull cannon back into the warp. The VP condition was that chaos had 12 points and the imperium 1 with a potential 15 (5D3) from the escaped units. The imperial player rolled his D3’s and each one of the escaped units provided him with 1 VP giving him a running total of 6. 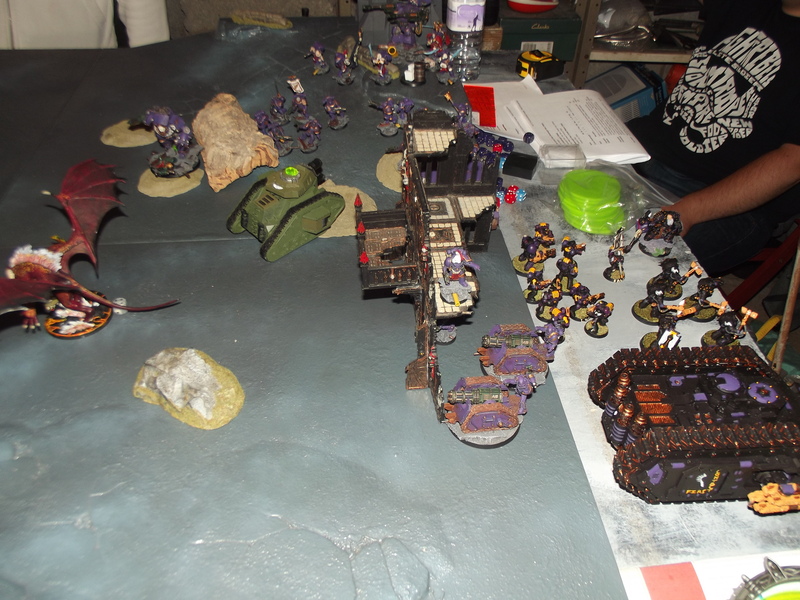 Squad Razak are bunched up around the wrecked sicaran and the forgefiend is nearby. The contemptor lines up the last surviving leman russ demolisher for destruction. 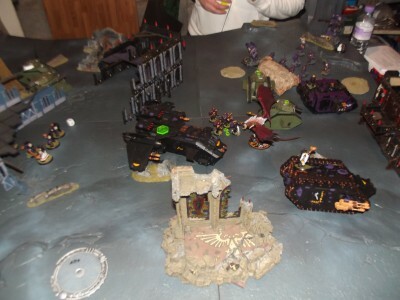 We called the game here as chaos was highly likely to gain at least 2 more victory points putting them out of reach, even if both wolf lord sigmar and squad razak managed to survive and leave the table. 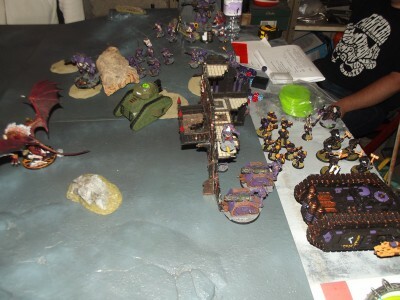 Kraken focused on his holomap as the Spartan moved forwards. Markers flickered out of existence as first there Storm Eagle was wrecked by enemy fire, then as three leman russ tanks were dealt with in short order. An enemy rhino burst out into the way of the storm hawks land raider and its multi melta then scored a critical hit blowing the machine apart. The squad inside managed to escape without serious injury and then weathered the enemies shooting before they followed the Spartan through the enemy’s line. “Teleport homers are online” His driver shouted. 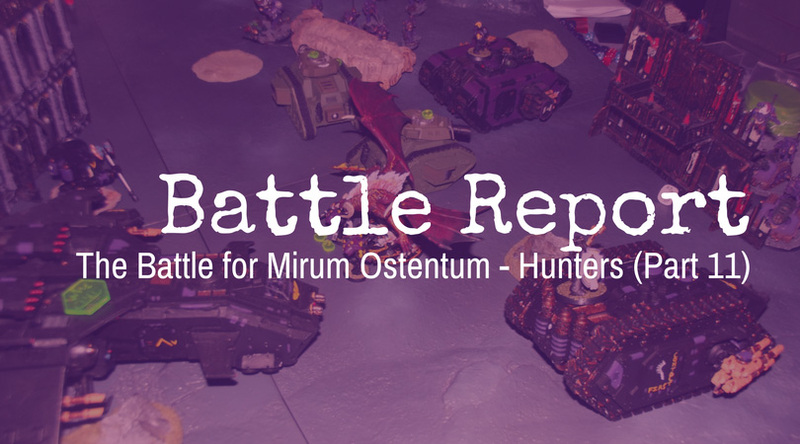 “True, we may yet win this war.” Kraken returned his attention to the holomap and began to review the wider tactical situation. 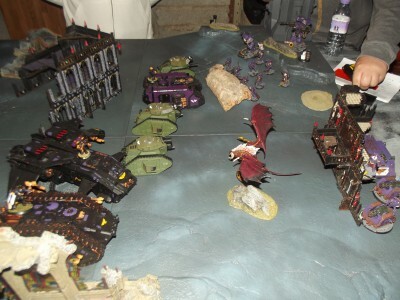 Lord commander Solomon Gyre walked calmly around the battleground, the smell of the storm hawk terminators teleport exit still hung in the air as the daemons of khorne that had aided him in this mission made sport with the remnants of the leman russ tanks that the enemy had lost. 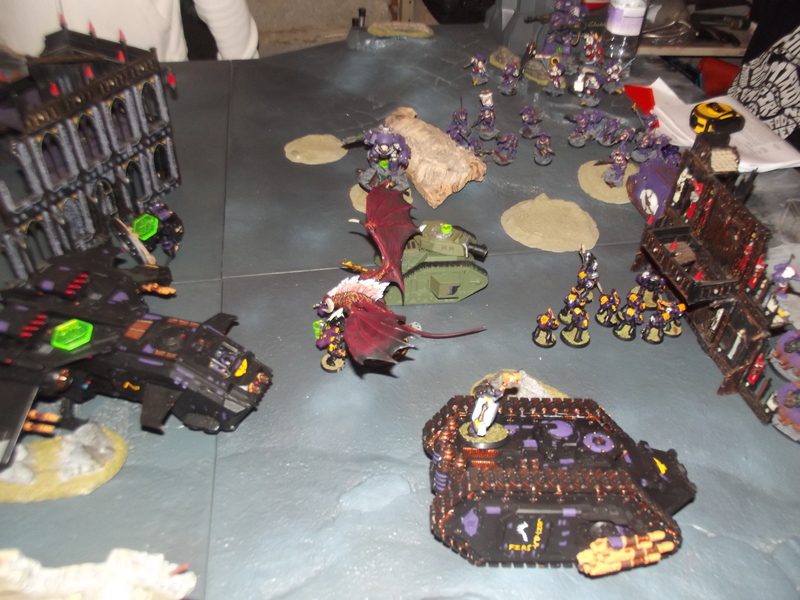 Despite them wrecking a sicarian and blowing a rhino apart the storm hawks had suffered more losses than his forces. He was still unable to enact his vengeance on the storm hawk commander for thwarting his previous efforts but he would get his chance. He smiled knowing that his foes were running out of places to flee to. 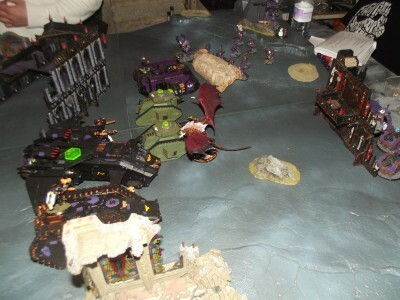 We called the game at the start of chaos turn 3 after our imperial player rolled 5 1’s for his D3 victory points per escaped unit (Scoring 5 out of the potential 15 victory points). 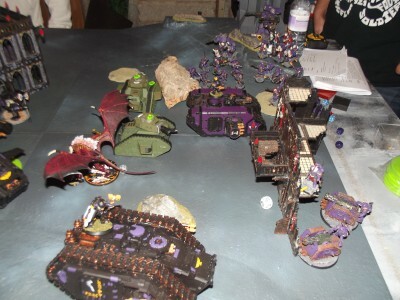 This left the imperial forces down 6/12 vs chaos with only 4 units left on the table. 2 leman russ tanks, one was about to be charged by the emperors children contemptor dreadnought and the other by the blood thirster of Rage. A wolf lord in combat with a blood thirster surviving on one wound and a squad of five terminators all bunched up and within range of the forgefiend. 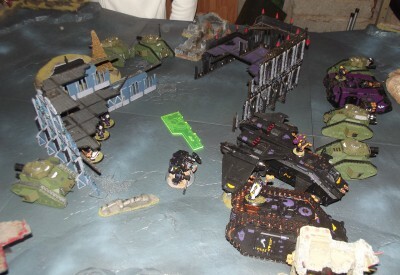 This meant that the imperial forces could not catch the forces of chaos with regards to Victory points. Chaos would probably earn another 2-3 in turn 3 putting the score at 6/14(15) to chaos and even if the terminators and wolf lord managed to leave the table the maximum the imperial player could get would be 6VP. 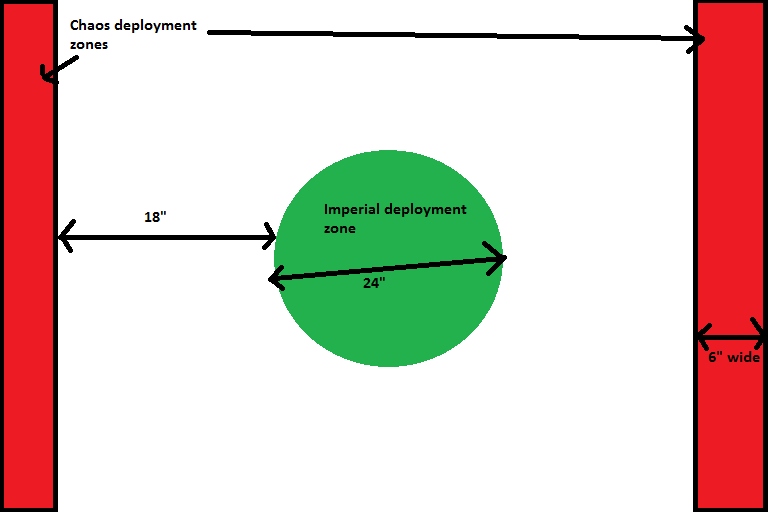 If the imperial forces had managed to gain a full 15 victory points the mission would have most likely ended in a draw. It would have then been imperials 16VP and chaos 12VP with four units left on the table (each worth 1Vp to chaos when killed). So, with this very lucky win for the forces of chaos we now move on to the Sudden Strike (thin the herd) mission. Where the forces of chaos unleash a lord of war on the imperial defenders, attempting to break through by inflicting as many casualties as possible and using the element of surprise to maximise the impact of the attack. 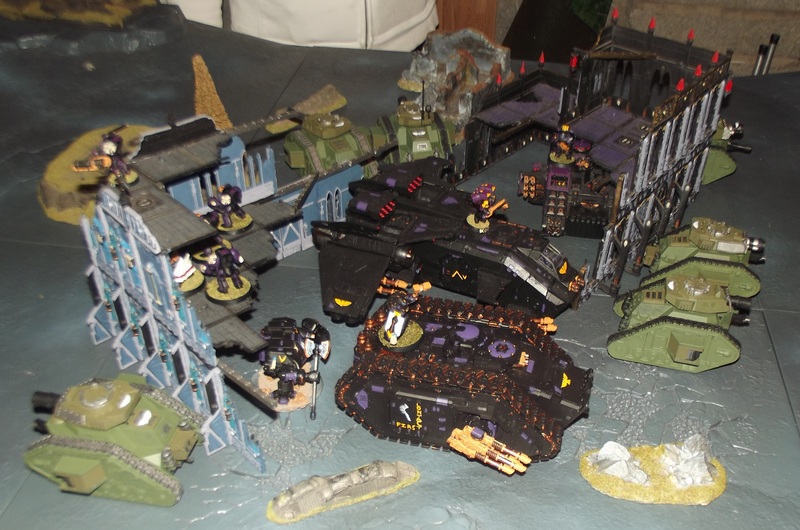 Even without the bad rolling for VPs, I think the Imperium was in a tough spot. Requiring perfect rolls just for a tie is still a tall order.